As used by the BBC for filming Otters Blue Planet & The National Geographic Channel as well as used by numerous underwater surveying companies. For mapping out Lakes, Rivers & Canals. One of the worlds leading Bait Boats. Renowned for Reliability and Robustness. 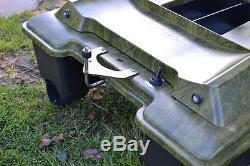 Twin independent hoppers capable of hold over a kilo of any bait in each hopper. 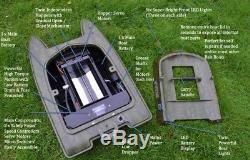 Remove the boat lid in less than ten seconds to expose all internal parts, great for self maintenance. Up to two hours running time on a single charge. Rear line clip feature, this allows you to clip your rig/swivel to the rear of your boat and drop separately from in side the hoppers (if you wish). 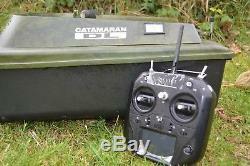 Bait capacity 3-3.5 kilos. One of the fastest Bait Boats out there. 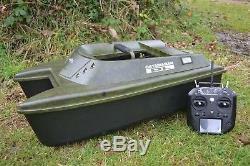 This is the ideal boat if purchasing abroad or wanting to hire these out on a fishery. 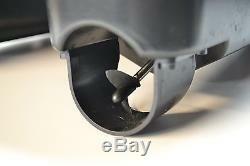 Reason, you can remove the boat lid in seconds to expose all internal boat parts. Unlike every other boat, if a problem did occur you can call up Anatec UK and explain the problem they can then send you out boats parts for you to fit yourself if necessary which is far cheaper then having to post back to the UK. Here at the Cabin we have run Anatec UK for over ten years. We honestly believe these Catamarans are one of the best boats out there. Easy to use and they sit well above. Water line making them the best boats to use in choppy conditions as well as being able to see it at a distance. Are also a bonus when using. You may still place your rig in side a hopper if you wish. Great feature, remove the entire boat lid to expose all internal boat parts. (Pictures above on the older 2016 Catamarans). 1 2.4ghz Digital Frequency (meaning no clashing of other units on the same water). 2 Massive 300+ metre wireless working distance. 3 Able to except software up dates each year. 4 Depth reading works in less than 12 inch's of water. The same lake bed readings, detail and graphics as the TF500 but with added GPS. 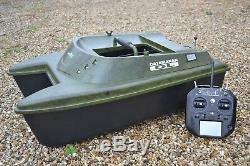 The Bait Boat GPS works a bit like SAT NAV in your car. You can store a location on any lake any where in Europe then simply take your boat out to the same spot year after year. For more detailed information on either of the Toslon units please see our other items. Every Anatec Catamaran package comes complete with. Standard Boat Bag (Deluxe available please see our other items). Spare Set of Heavy Duty Boat Batteries. Three battery chargers (one for remote battery pack). Spare fuse/prop and rear line rubber stop. French to UK plug adaptors with upgraded fuses, aerials & manual all ready to go... 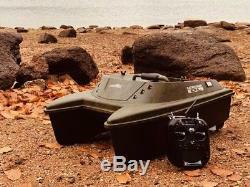 PLEASE NOTE THERE IS NO FISH FINDER INCLUDED IN THIS LISTING. We will however help you to find which batteries you require by sending you a link. 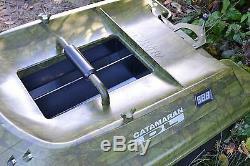 The item "Anatec Catamaran DL BAIT BOAT Devict oak" is in sale since Monday, April 22, 2013. 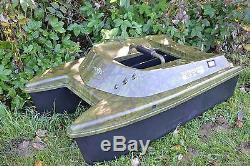 This item is in the category "Sporting Goods\Fishing\Anglers' Equipment\Bait Boats". ltd" and is located in Yelverton. This item can be shipped worldwide.